Freddy Jones Band at The Cubby Bear on May 1st! The Cubby Bear and 93XRT [WXRT-FM] will host their annual “Cinco Celebration” to celebrate Cinco de Mayo. This year’s fiesta will feature THE FREDDY JONES BAND [ http://www.thefreddyjonesband.com/ ] on Saturday, May 1, 2010, and opening acts, to be announced. Tickets will go on sale on Saturday, March 27 at 10am at The Cubby Bear box office and www.ticketmaster.com. Tickets are $15 in advance or $20, the day of the show. Doors will open at 8:30pm and the show will start at 9pm on Saturday, May 1, 2010. Attendees must be 21 and over. The Cubby Bear is located at 1059 West Addison Street. For more information, call (773) 327-1662 or visit www.cubbybear.com. OTB's Managing Partner Chris Stewart and guitar great Dave Mason, a voting member, were invited to the CBS Chicago TV Show Monsters & Money In The Morning to talk about the business of The Rock & Roll Hall Of Fame. Stewart and Mason were asked to explain why the band Chicago, with 35 records, hasn't been included. Click here to read Chris & Dave's response: >> See the Video. OTB’s newly signed artists, Troubled Identity, a Chicago area alternative rock band comprised of Highland Park and Lake Forest high school students, who just opened for The Freddy Jones Band at Park West in Lincoln Park late in ’09, is now in the studio recording their self titled EP for release later in the year. Troubled Identity formed in 2006 when Stewart, Subar and Nankin met while students at the famed Paul Green School of Rock, which served as the inspiration for the movie “School of Rock” starring Jack Black. Pomerantz joined the group in early 2009, and the band recently won the Highland Park High School Battle of the Bands competition. OTB’s Managing Partner, Chris Stewart & over 500 drummers from the drumming community was included in the new book Sticks ‘n’ Skins: A Photography Book About the World of Drumming. The 560-page coffee table book illuminates the eclectic world of drumming over the past 70 years. Fotos By Folletts photographers traveled to 53 cities in four countries and photographed over 500 drummers – many never-before-seen photos and stories of the biggest names in music history. Dedicated to the late drumming photographer Lissa Wales, Sticks ‘n’ Skins will open with a special tribute to her work. Well known to the drumming community, Lissa was a trailblazer in her field, specializing in capturing the heart and soul of drummers around the world. (To learn more about Lissa, please visit DrumPics.com). "This book documents our drumming history, thus preserving our talents and our reasons for why we do what we do for future generations to feel. It is a compelling and moving glimpse into the drumming community" -Dom Famularo, Drumming's Global Ambassador. For more information or to purchase your copy today, please visit www.sticksnskins.com. CHICAGO (August 13, 2009) – Chris Stewart, Managing Partner of OTB, will perform live with Dave Mason, Rock & Roll Hall of Fame inductee on September 3 at this year’s Ravinia Festival. OTB's Freddy JonesBand will perform at the 2nd Annual Benefit Concert for the Rock and Roll Hall of Fame and Museum (“Rock Hall”) scheduled for September 6, 2009 at the Booth Amphitheatre in Cary, NC. The tentative concert line-up includes: Freddy Jones Band, Darryl McDaniels, Patty Smyth and her band Scandal, Blessid Union of Souls, Nine Days, The Atlanta Rhythm Section, Georgia Satellites' and 94 East. In addition, last week event organizers announced the show-stopping configuration of the White Sox All-Star Band, which will include legendary Yes drummer Alan White; Queen keyboardist and vocalist Spike Edney; Fellow Queen guitarist and backing vocalist Jamie Moses; Former Journey lead singer Jeff Scott Soto; Superstar guitarist and Jimi Hendrix emulator Randy Hansen; World-renowned electric rock violinist Geoffrey Castle; and Progressive rock bass guitarist and White Sox co-founder Bernt Bodal. Read the entire pr release here. Click here for ticket info. 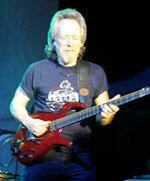 OTB's Harvey Mandel will be touring with the surviving original members of Canned Heat this summer. Several “Heroes of Woodstock” shows with five or six acts will include Jefferson Starship, Ten Years After, Big Brother and the Holding Company, Melanie, Mountain, John Sebastian, Levon Helm or Edgar Winter. Click here for tour dates. CHICAGO (April 30, 2009) -- The Rock and Roll Hall of Fame and Museum is pleased to announce that Chris Stewart, CEO of Chicago-based proprietary trading firm Gelber Group LLC, has been appointed to the Board of Trustees. Finally, on April 14, 2009, The Freddy Jones Band returns with Time Well Wasted. The new thirteen track album on Out The Box Records features ten classic live tracks recorded in 2007 at an intimate venue in Chicago, along with three brand new studio recordings: Home Thing, Contender & Empty Room. The Freddy Jones Band will be on the road starting May 15th with an acoustic set slated for Best Buy’s weeklong store grand opening in Chicago. See the Tour Schedule Here. To promote the new CD and build the fan list, OTB is also featuring a special Freddy Jones Band Time Well Wasted Free CD SWEEPSTAKES. FJB Hopefest Show A Success! The Park West Theater proudly hosted the 18th annual Hopefest, the leading benefit event supporting the Chicago Coalition for the Homeless. OTB’s The Freddy Jones Band joined Lubriphonic to deliver an amazing show with excellent sound and multimedia displays. “The Chicago Coalition for the Homeless was thrilled to work with The Freddy Jones Band for our annual benefit concert. Not only did the band deliver a great performance, they packed the house with their friends and fans, making the show a sold out success. With your help we raised a net profit of almost $40,000 and we proved once again that together we can make crucial difference in the lives of others. Thanks to you, Hopefest 2009 feels like an important victory in the fight against homelessness! -- Michael Nameche Director of Development Chicago Coalition for the Homeless. Catch this clip On "The Worlds Premier Psychedelic Guitar Player," OTB's Harvey Mandel. 'The Snake' shows how it is done in this ripping piece about the pioneering guitarist, from the from the vault of SF Bay Area filmmaker Rand Crook. WGN segment is up on the web, check it out! It looks great - it mentions the Downers Grove Best Buy / JBL Tour show, the album, Dave just looks great and the performance is awesome. Timm Martin and Chris Stewart, Managing Partners of Out The Box Records are pleased to announce the signing of The Freddy Jones Band. Chris Stewart said, "We are excited to bring the entire original band back to Out The Box Records!" Stewart added that Freddy Jones Band new CD will be released April 14th on the OTB label. The Freddy Jones Band is a roots rock band from Chicago, Illinois. Despite the name, no member of the band is actually named Freddy Jones, and the band has never definitively revealed the name's source. The group consists of Marty Lloyd (vocals and acoustic guitar), Jim Bonaccorsi (bass), Rob Bonaccorsi (guitar and vocals), Simon Horrocks (drums), and Wayne Healy (vocals and guitar). (Read their complete band bio). Their influences stretch across the archives of musical history in the tradition of groups like the Eagles, The Band and The Allman Brothers. Throughout the 90's, Freddy Jones built a loyal fan base. Capricorn Records signed FJB their first recording deal after a show with Widespread Panic at the Park West in Chicago, Illinois. From 1993-1999, they had 5 major label releases including Waiting for the Night (1993), self-titled independent release The Freddy Jones Band (1993), North Avenue Wake Up Call (1995), Lucid (1997), and Mile High Live (1999). After a 5-year hiatus, the original band reunited August 20, 2005 for the Riverview Music Festival in Chicago to a fantastic hometown crowd. The band is currently playing select dates throughout the country and is currently in the studio working on their next release, due out on OTB in the Spring, 2009. Check out the official Freddy Jones Band site, and MySpace page. Dave Mason helped open the new doors of the Roll Hall of Fame Annex in New York's Soho on December 2nd in an exclusive VIP gala celebrating the official opening. Visitors took an audio tour of the museum with wireless headphones then headed upstairsto a huge loft party. Rolling Stone's Jann S. Wenner gave the opening remarks, Dave Mason performed the Traffic hit "Feelin Alright," and Debbie Harrysang "Call Me" and "Heart of Glass." See Rolling Stones video clip report live from the party's red carpet. "...He's in peak form... he's never been in finer voice. It's a great mix of rock styles... it's vintage Mason, getting it together again." Chicago Blues Reunion will be back on the road in 2009 to support the Summer '09 release of a double live CD recorded earlier in 2008 in Chicago. Chicago Blues Reunion played a scorching 2 1/2 hour set with special guests, Dave Mason, Marcy Levy and Jimmy Vivino. The sold out show featured traditional Chicago blues, the wizard guitar of Harvey Mandel along with some old favorites by Dave Mason. Also in the editing room is a new DVD filmed by producer John Anderson (Brian Wilson's "Smile") featuring some of the performances from the Chicago live show and with numerous interviews from bandmates and friends. A particularly interesting scene is when the Chicago Blues Reunion members return to their old haunts and visit the homes of Muddy Waters and Howlin’ Wolf. Keep up on "What's Happs" - events, album debuts, artist tours, industry gossip and out the box ideas. Subscribe to the In Box. We’ll respect your privacy, wont sell your name or blast you with junk.